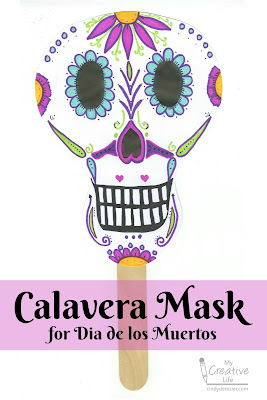 I had so much fun making a Paper Plate Calavera last year that I decided to make a calavera mask this year. I love how it turned out! It's really easy to do. The only limit is your own creativity! I've included affiliate links below. I'll receive a small commission for anything you purchase after clicking a link, at no extra cost to you. Fold the scratch paper in half and draw the shape of a skull on it. When you are happy with the shape, cut along the line you've drawn, keeping the paper folded. If you want to make tweaks to the shape, refold the paper and cut small amounts off of the areas that aren't quite right. Open the paper and mark where the eye holes should go. 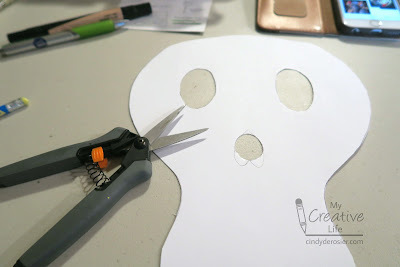 Fold the paper and cut out the eyes. With the paper still folded, cut a small semi-circle along the fold for the nose. 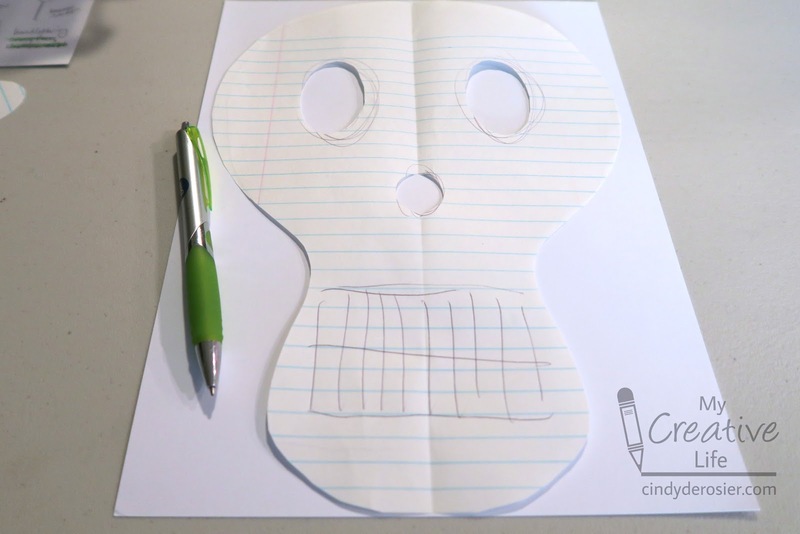 When you are happy with the shape of the skull, trace it onto the cardstock. 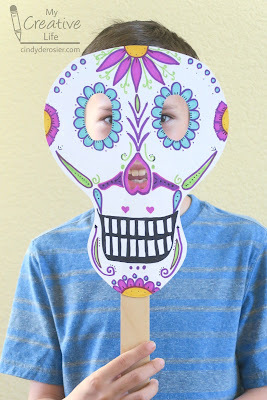 Cut out the skull. Microtip scissors work great for getting in small areas like the eyes and nose. I ended up changing my mind about a round nose. Below you can see the upside down heart design that I drew (and would soon cut). Now use the pencil to start designing! I put the teeth in place first, then outlined the eyes with petals. Next, I added flowers to the top, the chin, and where both ears would be. Once I'd drawn these features and was happy with their placement, I went over them with pens. Then I filled in the empty spaces with designs, making sure to maintain vertical symmetry. There's no right or wrong - have fun! 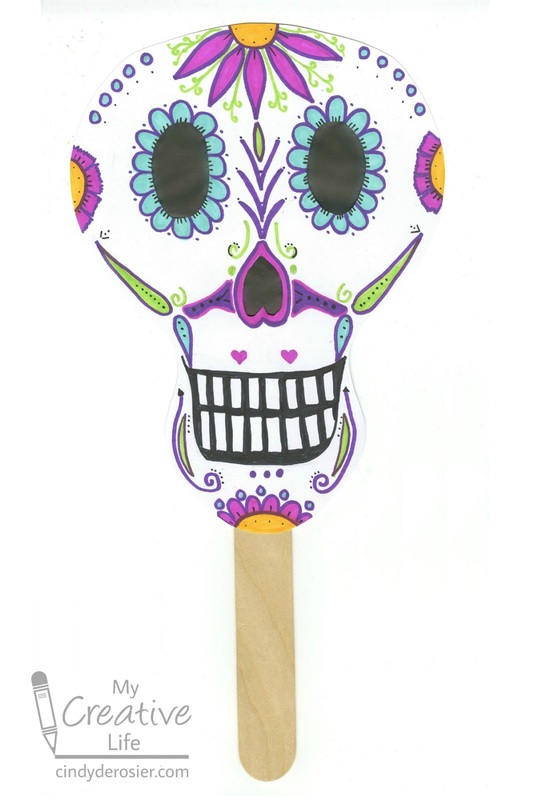 When you are happy with your design, glue the stick to the back and your mask is ready to use. 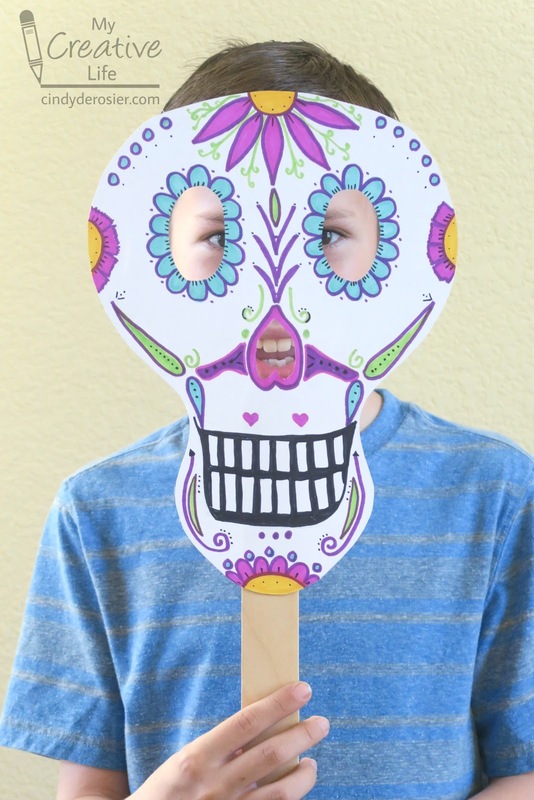 Trevor thought it was funny to hold the mask far away from his face so that I could see his smile through the nose hole. 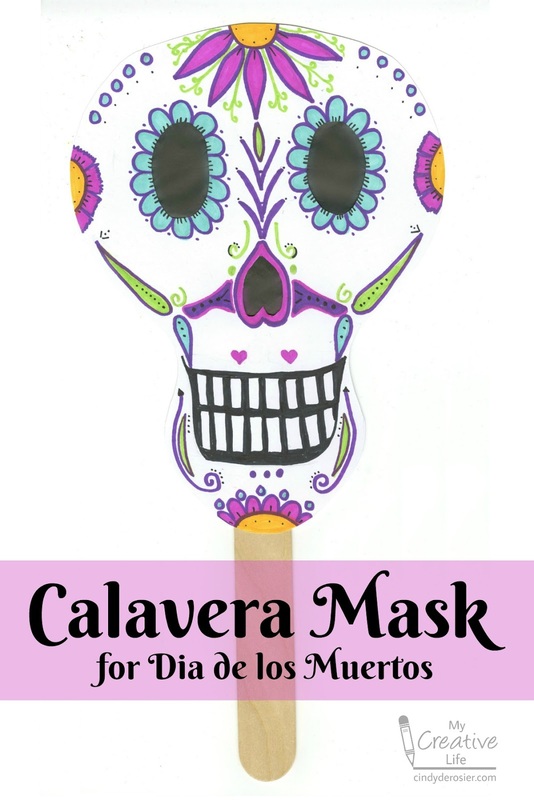 If you plan to display your mask rather than wear it, you can add black tissue paper to the backside to cover the eye and nose holes. Give it a try! 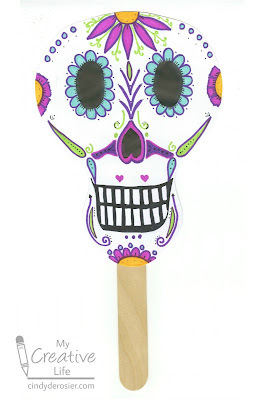 It really is a lot of fun to make your own calavera. Ohhhhhhhhhh so fun! I will have to show this to Brookie later!!!!!! !